A French Fatum: Apple cake goes global! This is just a quickie until I get home tonight and can properly do a staycation regurgitation of photos and fun....we're heading up to the Big City--ahem--Le Mans for us country folk--to check out the Foire du Mans for our hot Friday night date (I hear jealousy ;) ). 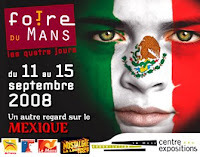 This is a big fair with all kinds of everything having to do with services, vendors, activities, you name it, all related to Le Mans (www.foiredumans.com if you're really bored, Mexico is this year's theme?? I will need to talk T down off the salsa ledge, real Mexican salsa, a la North Carolina, will not be making an appearance in Mans no matter how much he dreams!). We're hoping to find our architect so this project can move from dream phase to reality, although, being a realist I'll be happy to leave with just some relevant information to life here. So, the last couple of days Freya and I have been taking breaks and walking the property and sampling the various fruit trees that made it to fruition (ohhhhh....that was a totally unthought of pun, I love Fridays!) and I used the first couple of apples collected to make an apple cake. Nothing fancy, but in gathering my ingredients I remembered the pecans from Mom & Dad J's old house in NC sitting in the freezer (oh the tasty memories...siiiigh) and threw those in for good measure. So, put apples from our orchard, pecans from NC and eggs hatched in the Sarthe and what do you get? An apple cake gone global!! I have to tell you it was deeelicious....when I've finished licking the crumbs off my fingers I'll take some pictures of the leftovers to share, or is that just cruel? Bon Appetit for whatever you're snacking on and catch you after the Foire! Ineed a pic of the cake! Yes, it will be cruel but still worth it. Want to stay in Paris? Stay Chez M-J!